This week was a last minute change due to a ridiculous down pour, rendering us stuck inside some distance from our preferred destination. So, we assess the situation and put our ‘what’s the best option in here’ hats on. what we discovered was a pleasant surprise, not just for taste, but nutrition too. We had grand plans for this weeks’ ‘52 Eats’, something a little different, however, the terrible weather that was experienced in Sydney on Saturday put a damper on those plans. And as such, we got stuck. And then we got a little desperate. Which resulted in us having to use a less than ideal eatery as this week’s blog post. Both of us had just finished massive workouts and were in dire need of getting food back into our system ASAP (note MC is on a new ‘gun’ program so needs to feed the beast in order for those biceps to grow). It was absolutely teeming down rain outside, and we found ourselves stuck in a suburban shopping mall with not a lot of food options available to us. After much debate we manned up and decided on Nando’s Flame Grilled Peri-Peri Chicken. The food snob in me was not overly happy, but we both needed to get some post-workout fuel stat. In this scenario, not eating or fasting was not an option. Regardless of whether your training goal is to increase size, strength or reduce fat loss, eating post-workout is crucial for overall recovery and success. On the completion of a hard workout it is important to refuel within 60 mins in order to help increase the uptake of nutrients into cells in order to help the repair process. Many people tend to under estimate the importance of post-workout meal timing, and for us, eating something, was better than eating nothing. 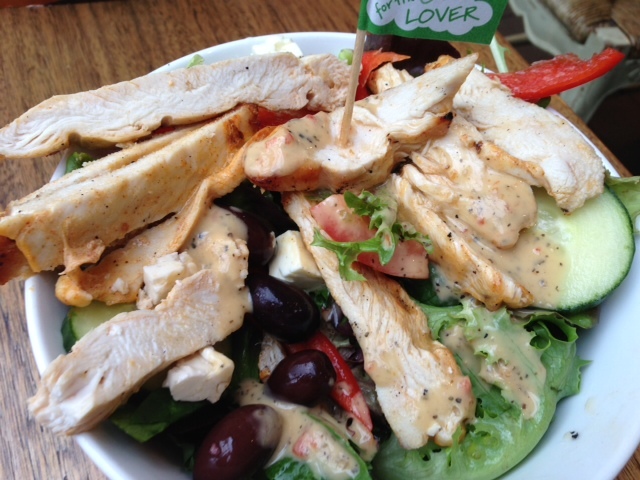 The great thing about Nando’s is that their menu is quite large, and caters for the more ‘healthy conscious’ person, which meant we were able to get salads and grilled chicken. To be honest I was surprised at how good it was. The salad was fresh and the chicken was lean and tender. It was a good outcome for an otherwise desperate situation and whilst it didn’t completely fill me up it was enough to keep me going til we got home. The take home point is this; there will come a time when you cannot have access to quality food, or something happens which is beyond your control and interrupts your routine, or you are desperately hungry and have to make a snap food decision; it’s going to happen so avoid stressing out over it. Make educated food choices, by choosing the salad/veggie options with grilled meat (refer to the food court post for ideas), or if that is still not available to you indulge in a non-ideal meal and know that your quality nutrition for the rest of your week will make up for it. Remember a quality nutritional plan is one that enables you to eat clean and be healthy most of the time, and has allowances for the odd time where it is not always feasible. Great work there NN. I was a little unsure what I was going to say about this week’s food stop. Another food court, but this one in a mall that is near dead on the weekend due to its location deep inside office territory. So there were other options in there, and being in the post-training window that NN mentioned, we certainly had some more flexibility up our sleeves (Yes, I was wearing sleeves. See aforementioned torrential rain). The reason I say this is that post training is a window to eat some of the sweeter foods- such as fruit or even more so like chocolate etc. without over doing it- a small amount of sweet food in this window- when taken with high quality protein- will help the body to absorb the amino acids from the protein into the muscles. The plan was to hit the North Sydney Markets and make the most of some locally grown and produced foods to show case the wonderful stuff you can get at markets with local small businesses. Having a face to face chat with the person that farmed an animal or grew the veggies you’re about to eat is a sure fire way to know its history and therefore how god it’s going to be for you. Oh yeah, and we were picking up a whole shitload of meat that we ordered from The Free Range Butcher. 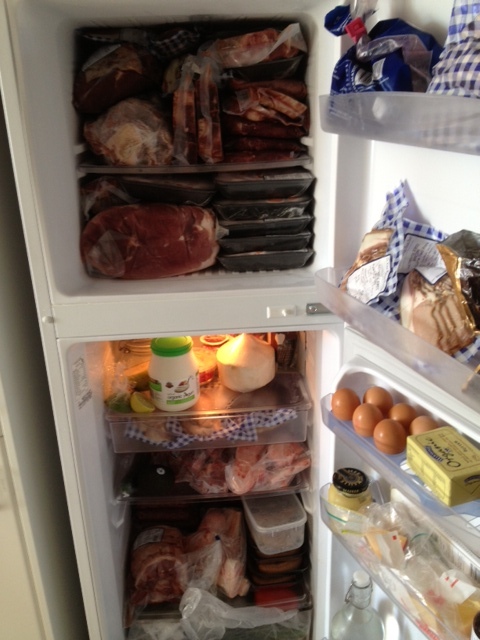 A friend and colleague of ours had sorted out a whole cattle beast and pig to fill our respective fridges, freezers and stomachs. 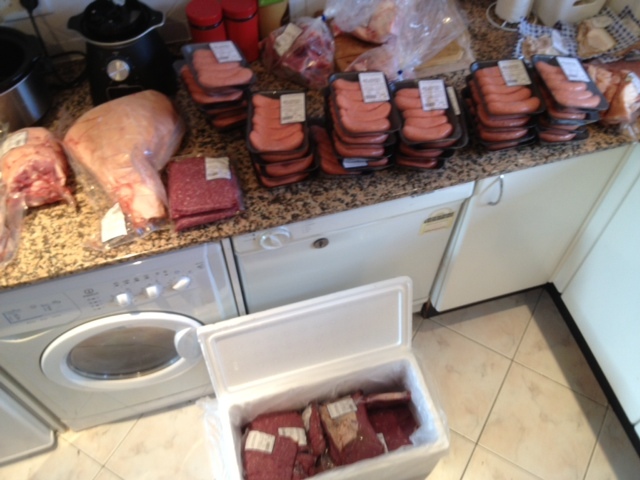 We now have so much meat, I don’t know where to start. 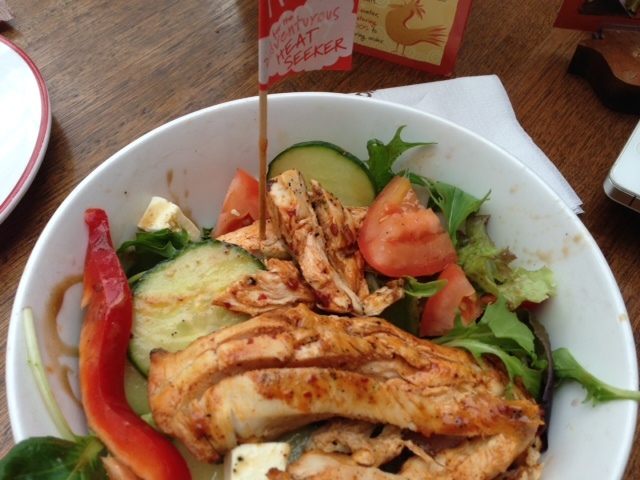 Anyway, back to the spicy chicken… Nando’s soon became the best option, with fresh grilled chicken and tasty Mediterranean salad made in front of us as we waited. The salad was pretty tasty, for something so quick, and was essentially clean on the nasty-front. 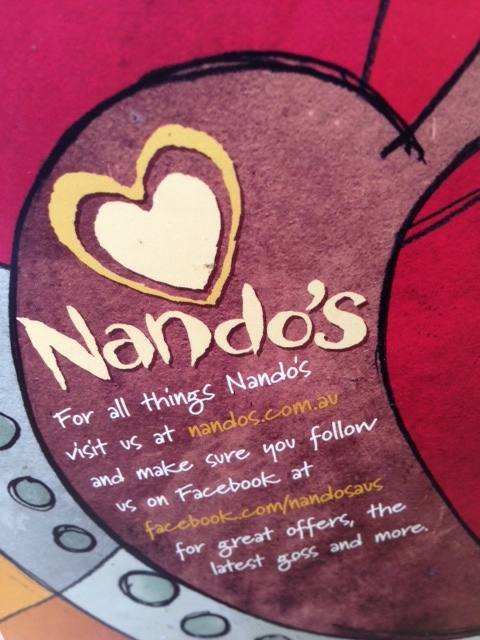 In terms of finding fast and efficient food in tough situation, Nando’s delivered big time. Obviously it’s never going to be gourmet or get a really high rating, but for quick, convenient and last minute options this was the goods. Of course I could have gone for a sugar packed juice, donut, coffee and accompanying biscuit elsewhere, but that would be a foolish wrong turn. Take note of the easy and good options that you can find in times that don’t fit your original plan. Having ‘go-to’ options around your home and work are a key to nutritional success. We all get caught out from time to time, unprepared, in a rush etc, but having an pretty fail safe option up your sleeve is crucial. And remember that you can also buy a whole cow and/or pig and never leave home for about 5 months. That’s an option, you know… if you love quality meat as much as me. In all seriousness, this is a fantastic way to reduce the cost of high quality, naturally raised meat- buy in bulk. Just make sure you can pack a freezer and fridge as well as I can- killed it!